Choosing between different DSLR camera bodies can be challenging. This D7100 vs. D5300 comparison should help you determine which of these two setups is a better fit for your needs. The D5300 came out just under a year after the D7100. However, it features several updated features. Those include the Expeed 4 image processor, a fully articulated LCD screen, and a higher ISO range. The D7100 is a generally better buy, though. That is due to its compatibility with a wider range of Nikon lenses. It also has a superior viewfinder and a premier auto-focus system. In addition, it boasts better continuous shooting capabilities and a weather-sealed body. This article will cover these features and more to help you determine which is better. The Nikon D5300 is considerably lighter and is a bit more compact than the D7100. That may make it slightly more attractive for photographers who want something that is portable. It is easy to carry around on long walking trips. Weighting in at 480 grams, the D5300 has 37% less weight than the D7100. That one weighs 765 grams. Its measurements are also more compact. They are 125mm x 98mm x 76mm, whereas the D7100 is 136mm x 107mm x 76mm. The D7100 also has a built-in headphone jack. That way, you can monitor audio while recording video. This jack was not included in the D5300. Both cameras have the same APS-C sized sensor and F mount. Therefore, the lenses for similar aperture and focal length will be similar weights and sizes. The D7100 has more options when it comes to older Nikon D7100 compatible lenses without built-in AF, though. We will cover that more in the next section. Perhaps the biggest reason photographers may prefer the D7100 over the D5300 is the weather-sealed body. The D5300 is not weatherproof. That means that anything past a few errant raindrops or snowflakes can permanently damage your camera. The weather-sealed D7100 can be used in almost all weather conditions. There is one area where the D5300 shines most significantly. That is with its more robust image processor, the Expeed 4. The stronger processing capabilities allow the D5300 to perform better than the D7100’s Expeed 3. That is the case particularly when photographers are shooting continuously. There is also better noise reduction in photographs. That comes in handy for photographers who shoot video or continuous sequences. The D5300 also has a higher max ISO, with a range of 100-12,800, compared to the D7100’s range of 100-6,400. This means the D5300 can possibly shoot better in lower light. However, there is so much noise in images shot at ISOs above 6,400 that photographers are unlikely to use this feature. The D5300 captures less noise in images. However, the D7100 captures more detail. It is hard to say which is better overall when it comes to image quality, though. The differences between the two are minimal. Both bodies performed similarly in shooting tests in identical settings. The differences in the final products were so small they hardly make a difference. One area where the D5300 shines is the minimum focus distance. The D5300 can focus at 11 inches, while the D7100 can only focus at 17.7 inches or further from a subject. Purchasing a zoom lens can compensate for this, however. One of the biggest differences when it comes to the physical hardware on both cameras is the LCD screen. 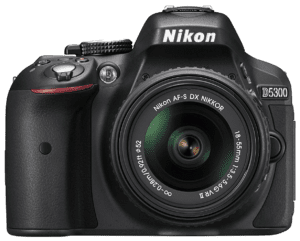 The D5300 features a rotating, hinged screen, which allows you to pull the screen out from the body or rotate it to the side, while the D7100’s screen is fixed on the body. While this is not a major difference, the added benefit can be difficult to work without if you get used to having it. While the D7100’s LCD screen doesn’t move, it does have a higher resolution, with 1,229k dots instead of 1,037k dots. This just means the picture you see when you view photos on the camera will be better and will give you a slightly more realistic idea of what the image will look like on your computer. The D7100 comes out ahead when it comes to the viewfinder though, with 100% coverage and 0.94x magnification, compared to the D5300’s 95% coverage and 0.82 magnification. This makes it more comfortable and easier when composing images. The quality of the image you see on the D7100 viewfinder is also superior due to its pentaprism viewfinder, which is a solid block of glass, or a prism. The D5300 has a pentamirror viewfinder, which uses three mirrors to achieve the same thing. This method is cheaper and lighter but produces an image in the viewfinder that is lower quality and dimmer than the pentaprism. This is one of the biggest areas where the D7100 takes the cake. Not only does the D7100 have an auto-focus motor built in, but it also has more auto-focus points than the D5300. The built in AF motor means the D7100 is compatible with older Nikon lenses that don’t have AF, giving you a wider selection of lenses and allowing you to use potentially cheaper, old-school lenses. The built in auto-focus motor may not be a big deal if you only purchase newer lenses that have auto-focus themselves, but make sure you think about whether you want the ability to use lenses without AF in the future. Since the D7100 also has 12 more auto-focus points than the D5300, it focuses faster and does better in lower light. This difference is less significant when you compare the D5300 to other entry level DSLR cameras to mid-level, like the Canon T4i, which only has 9 auto-focus points. At 39 points, the D5300 has a very sophisticated AF system. While the D5300 is a great choice when compared to other entry to mid-level cameras, the D7100 is hard to beat. It is equipped with the same AF system as Nikon’s flagship D4, with 51 auto-focus points, including 15 cross-type points. The D5300’s auto-focus system will work great for all photographers except those dedicated to action photography though, so consider what you will be using your camera for when deciding if you want to spend the few extra hundred dollars on the D7100. The D5300 comes with built-in wireless capabilities and GPS, which do not come standard on the D7100. The wireless allows you to connect your camera to your smartphone and transfer photos directly to your phone or tablet without having to go through a computer. This can be a great feature for sports photographers who have to deliver photos to their editors during a game, or photographers who need to send images to clients as a preview or post pictures on Instagram or other social media platforms on the go. This is the first Nikon platform to have built-in wireless and GPS, which allows photographers to geotag their images. These capabilities also allow photographers to control their cameras with remote controls. This is a great feature if you need to get in the photo or set up your camera and shoot from a different location and don’t want to rely on the camera’s clunky timer setting. Flash is another area where the D5300 really falls short. With “Strobist” techniques becoming more popular in recent years, fill flash and other flash skills have taken up an increasing role in amateur and professional camera photography. The D5300 lacks high-speed-sync (AFP) and external flash control for the camera’s built-in flash. While the lack of external flash control isn’t a big issue, not having AFP is a considerable issue. Photographers who use their camera with a wider aperture and push the shutter speed past 1/200ths of a second won’t be able to use external flash since 1/200ths of a second is the highest speed the camera can sync to. This eliminates fill flash for portrait photography or flash for high paced action photography, such as sports or wildlife. If you anticipate needing to use your flash past 1/200ths of a second, you have to go with the D7100 due to its AFP alone. The D5300 is a great option if you are looking for a good, basic camera body and you shoot primarily with natural light. While it has several updated features, like the Expeed 4 image processor and the fully articulated LCD screen, its limitations might limit professional photographers who need to use external flash or shoot in high paced environments. 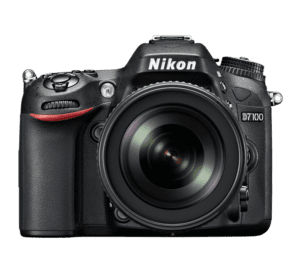 The D7100’s more durable body, superior viewfinder and LCD display, headphone jack and premier autofocusing system make it the clear choice if you plan to use your camera for anything above basic photography.